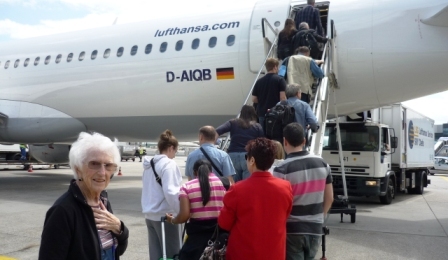 My mother has traveled to over 30 countries on 6 continents, about half with my father in the adventurous years after children and before infirmity, the other half on her own or with a friend or family member. My mother is 91 years old. She has no vision in one eye and very limited vision in the other. Her hearing is ok if you are seated across from her directly at a distance of no more than 6 feet. She wears hearing aids which seem to vary in their usefulness. She frequently repeats questions which have just been answered. Occasionally she Is afflicted with digestion troubles. My mother lives next door to me and has become my best friend. I think I am hers also, as almost all potential rivals for that title are deceased already. My mother declared on her 91st birthday that she wanted one more trip. I had quit my salaried job 9 months previously and my other siblings have work, children at home, and other impediments. We began trying to figure out where and how to go. Then the European economic bubble burst, and the Italian cruise ship Costa Concordia ran aground in Sardinia – suddenly the cost of high-end cruises in Europe tumbled. Even including the plane fare, we could go by 6-star cruise line from St. Petersburg to Copenhagen, stopping at Helsinki and Stockholm along the way, for less than the cost of an Elder Hostel cruise from Detroit to Quebec City. Wow! Four countries on one trip which Mom had not visited before! And I have business friends in St. Petersburg who could show us around a bit. We cast aside our fears and signed on. Mom might lose the batteries for her hearing aids. We bought three times the number that would normally be needed; I carried a supply, Mom carries a double supply. Mom might fall on the boat. She hates to use a cane because “it makes me look old and feeble”. My husband bought a specially sturdy foldable cane in a fetching shade of pink. My sister bought a not-as-sturdy foldable cane in a pink paisley pattern. Mom promised to try. Mom might get lost on the boat, since it is hard for her to distinguish signs and numbers at any distance. I bought a set of walkie-talkies which I hoped we could use on the boat and on sight-seeing trips in case we got separated, assuming she can figure out the buttons. Mom might be cold in those Northern latitudes, even though we were traveling just after the summer solstice. We exhumed thermal underwear from long-ago ski trips and discovered the elastic had disintegrated. I had two sets of silk long underwear – Mom is borrowing one. At the last minute Mom packed the old thermal underwear anyway, just in case. Mom might have one of her infrequent bouts with spastic colon. At the last minute we stuffed every cranny with adult diapers. Mom has a hard time these days with check lists. It is hard for her to remember what she intended to pack vs. what she has actually packed. My sister and niece came down for a weekend armed with a detailed checklist provided by my cousin, a cruise veteran. It took six hours of making decisions, but the suitcase and carry-on were packed to perfection except for the hearing aids, medications, and glasses. Mom has a hard time juggling documents. I took charge of the passports, cruise documents, luggage tags. Mom might be uncomfortable sleeping on the plane. My husband found an easy- to- inflate neck pillow and a pair of shocking pink eye-shades. My husband, sister, older brother and I walked ourselves through every possible scenario. We packed backups for everything that could be used up or exhausted. I have never travelled with such a full suitcase on the outgoing flight (coming back, stuffed with souvenir and presents, is another matter). With fingers crossed for luck, we set out. For a nonagenarian, a 20-step loading staircase is a challenge. Will we meet it? I’m eager to hear the next episode! !